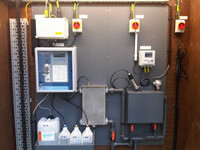 The predominant application for on-line ammonia measurement is final effluent monitoring, at waste water treatment works. 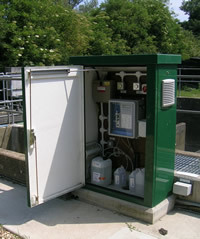 Companies such as Wessex Water and Severn Trent Water have extensively installed the Proam ammonia monitor to continuously measure final effluent quality and demonstrate compliance to imposed consents. Internationally, the Proam ammonia monitor has also been installed throughout China for similar applications. The biological nitrification process is used to remove harmful ammonia from waste water. The Proam ammonia monitor has been installed at the Davyhulme WwTW in United Utilities, to provide feed forward and feed back control at a large BAFF tertiary treatment process. The enhanced control has reduced associated energy consumption and operational costs. The quality of final effluent and the presence of ammonia is often measured at refineries. The ProAm ammonia monitor has been supplied to the Hindustan Petroleum Corporation (HPCL) and Mittal Energy who have built a new plant - Bhatinda petrochemical refinery, in Punjab in North India. Many industrial manufacturing processes use ammonia based compounds or generate bi-products, which may affect waste water quality. The Proam ammonia monitor has been installed to measure ammonia release at the steel manufacturing facility located in the Scunthorpe and managed by Corus. The instrument has also been configured to continuously measure chloride concentrations at the Johnson Matthey precious metals recovery facility, located in Royston. Many industrial premises have large hard standing pavements which produce significant surface water runoff. 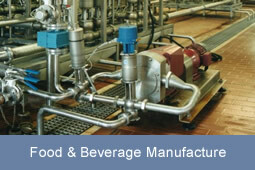 Potential product release to surface water is often continuously monitored. Agrichemical manufacturers have installed the Proam ammonia analyser to detect nitrogen based compounds. In the UK, Growhow at Ellesmere Port use the Proam instrument to demonstrate final effluent compliance once surface water has passed through an oily water separator. The ammonia content is an important parameter defining water quality and can be used to indicate the presence of untreated sewage in rivers and an increased risk of pathogens. 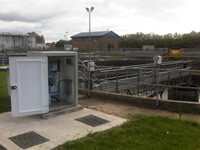 Thames Water at Beckton WTW has installed a Proam ammonia monitor to continuously monitor the quality of water abstracted from the lower tidal reaches of the River Thames. Many installations have also been made to monitor river water quality across the Henan Province in China. The instrument must be designed to reliably measure sample containing significant biological and solids content.